Boden have just launched a new 'icons' collection inspired by "the rich, eclectic heritage that makes British style iconic" modelled by British supermodel Karen Elson. What I love about this collection is that it is totally wearable and interesting without being OTT. 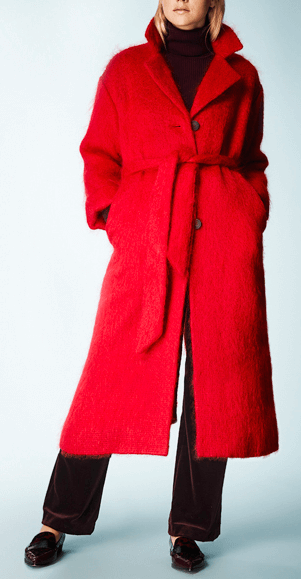 This mohair 'Spittlefields' coat is gorgeous. Inspired by a famous Dickensian character the oversized belted design is right for now but I particularly like the way it is perfectly in-between smart and casual. It would work well for work but you can definitely wear it on a night out without looking or feeling 'worky'. Available in a bright cheery red or a heritage check, my finger is poised over the 'buy' button for the heritage version. Ankle boots are an absolute wardrobe essential, I almost always will include a pair in my client's 'priority list' when doing a wardrobe revamp. The Chelsea Boot is of course a total classic and you would get so much wear out of this heeled pair from Boden. Boden always have a good choice of knits for Autumn/Winter, I love this military style in khaki which you can just throw on with jeans and have a more interesting look for the school run in super fast time. If you don't enjoy working out what trends suit you and your body shape and would like some help navigating the shops, get in touch today. I always have an initial chat to find out what you need from your wardrobe and then advise which packages are best for you.